Website traffic is like the blood coursing through your body and your marketing efforts are like your heart. If the heart fails to pump enough blood to the rest of your body, you surely are going to wear out and eventually come crashing down. Similarly, if your marketing efforts fail to bring in quality leads to your website, your ROI is weakened eventually your brand may come crashing down. 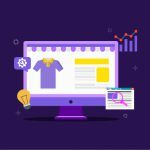 This is evident no matter how effective your products might be or how attractive your online storefront may be. Need digital marketing solutions to bring visits to your storefront, but don’t have enough time to read through the article? Bookmark this page and meanwhile, contact us for a speedy solution. Additionally, once your visitors reach your website, conversion becomes the next goal. If you manage to land your prospects to the relevant webpage containing the products that are applicable to them, your chances of converting them increase considerably. This article will focus on different methods to increase online traffic and how to increase conversions amongst them. Before we jumped ahead towards drawing in more traffic to your website, it is important to understand the kind of audience you are targeting and the kind of audience you are planning to draw in. You can bait in new visitors if you understand what their interests might be and a peek into your website’s analytics can be the goldmine of your target audience your brand needs. Check out our list of handy analytics tools for ecommerce to find out which is more suitable for you. 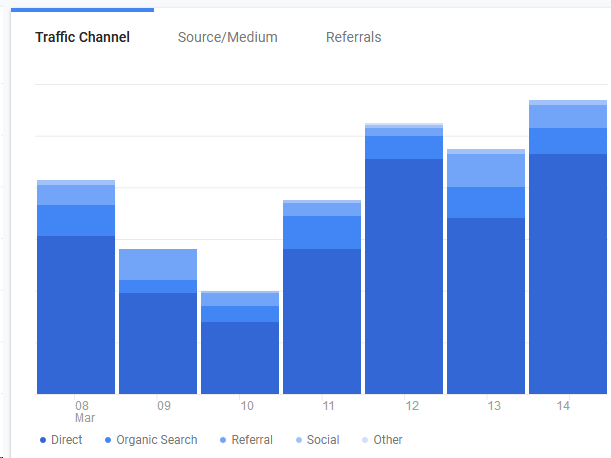 The analytics tools can help you draw in demographic information such as Location, Time of visits, Pages most visited as well as the time spent on a page. Once you have the necessary demographic data, it is now time to target people with similar interests, facing similar problems or looking at a specific service or product. Organic: Such visits are when people visit your website by searching naturally on any search engines without any external forces. Inorganic: Such visits are when you pay search engines and other platforms to redirect traffic to your websites. As per the Inbound Methodology, what you are offering should draw the people towards your website instead of you going towards your customers. Being the first result when your prospects search solutions for their problems is a great way to achieve that and to do so, your website needs to optimize its content for keywords that your prospect would search for. Contrary to popular belief, SEO is not restricted to optimizing your website content for keywords but also targeting long tail keywords. Search engines function on different algorithms that display results based on the domain & page authority (DA & PA) of the websites. The higher is the DA of your website, the more are your chances to be displayed on the first page of the search results organically. The DA increments logarithmically, so it is easy to progress from 20 (bad ranking) to 40 (average) but reaching 60-70 (good) takes a lot of effort. One of the best ways to gain better DA is to get referred by some 3rd party pages with better rankings. When you get unique backlinks to your website, the DA rank increases subsequently and this helps you rank better on your targeted keywords. Word of mouth promotion is the best way to ‘spread the word’ and when people see other ‘human’ being benefited by your product or services, it builds trust. When your prospects chance upon testimonials about your products or services, they are motivated to visit your website to learn more about them. 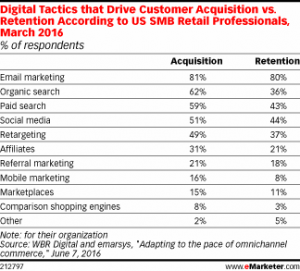 Emails were chosen to be the most effective channel for acquisition as well as retention by 81% and 80% marketers as per a survey by DMA and eMarketer. Additionally, you harness the power of reaching your prospect’s inbox that is endemic to emails. So you can utilize email marketing to send promotional emails or newsletter to direct your prospects to your website. This may not be applicable to every brand but those who pursue an omnichannel approach for their business can redirect their existing customers to their website. This not only increase the website traffic, but you also make it easy for the customer to remain engaged with your brand. Moreover, by offering online ordering and in-store pickup, you make it easy for customers to do business with you as per their convenience. Digital Ads are the second optimum way to reach your target audience without exactly knowing them. Based on the demographics you built from your existing visitors, you can set up display conditions to display your ads to those who fit your target audience description. While the chances of the prospects to click your ads are lower than other marketing channels, the conversion rate of those clicking are comparatively high as those who click are genuinely interested and wish to dip their toes before jumping. A successful business ‘thrives’ on new customers as long as they are ‘surviving’ on existing customers. While you cannot please everyone, you should always attempt to revive your dormant customers as repeat orders are the lifeline of any business. An engaged customer would repeatedly purchase from you and that keeps your business run smoothly compared to one-off purchases. A subset of display ads, retargeting ads run tracking pixels or cookies installed on the customer’s device and involves showing ads that are relevant to their current position in the customer journey. A true form of blessing in the form of a tool for eCommerce industry, Google Shopping is a paid search platform and built to increase eCommerce traffic generation. Using Google Shopping, people can see pictures of the product they are searching for, compare prices between different eCommerce retailers. A variation of 3rd party backlinks where instead of you getting linkback in exchange for quality content, you pay to place valuable backlinks in the form of paid promotion on such platforms. Similarly, getting a ‘shout out’ from industry influencers can also redirect eyeballs to your website. 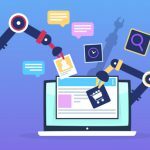 Even though these kinds of promotion can help you gain web traffic in droves, your website content needs to be strong enough to retain those visitors. Assuming that the above methods got you a huge influx of website traffic, it is now time to convert those into paying customers. It is a common mistake to assume that everyone visiting your website is interested to make a purchase at the first visit. You need to employ different tactics to educate your visitors based on their current requirements and push them in the correct direction. Optimizing your website content to convert visitors involves understanding your visitors’ needs, what your competition is offering and what are the benchmarks in your industry. Whether your prospect reaches your website from search, social, display ads or emails, it is important to land them to a relevant landing page instead of your homepage. This not only caters to the niche of your brand, but it also prevents the visitor from being overwhelmed by information overload. E.g. If your brand is into selling Professional cameras and its related accessories, by landing someone looking to venture into the domain of photography to a landing page that talks about beginner-level DSLRs and accessories would help better conversion. 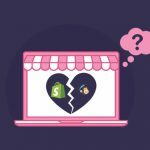 Most of ‘try then buy’ works well for eCommerce industry as this gives the prospects a chance to test your offerings before they commit to buying it. By either offering a free trial or sample subscription for a small fee, you are being customer-oriented instead of product-oriented. Imagine listening to the same song everywhere you go. Soon you may consciously or subconsciously start filtering out the song. This is what happens to your visitors when they are offered the same marketing tone, whether they check your competition or your products. Your website content needs to add value to the existing ‘run-of-the-mill’ message in order to capture the attention of your subscribers. As we stated earlier, your content needs to engage with your visitors for them to keep coming back. Instead of telling that your products/service are the solutions to the problem they face, your website content should focus on how to solve the problem and suggest how your product comes into the picture. Case studies are a great way to show worth in your products. A case study from a customer’s point-of-view explains how your product or service helped your previous clients. You begin with the overview of the problem faced, what challenges were faced, how your product/service improved the situation and end with a comparison of the early scenario with the current situation. When you ask your visitors for their opinion, you make them part of something bigger than a business – client relation. Your prospects feel like important decision makers and this helps you engage them in a better way. What works for one shouldn’t necessarily impact others. What you communicate may not change overall but how you present it can be A/B tested for better conversion rate. By analyzing your website in real time gives an idea about how (and what) a visitor interacts with and based on the observation you should make changes within the elements to check the impact on the performance.